According to GTM Research’s Utility PV Market Tracker, as of August 2016, there are 11 states with 500 megawatts or more of PV projects in development and a total of 20 states with 200 megawatts or more under development. Historically, a few states made up the majority of utility PV installations, including California, Arizona and North Carolina. However, with last year’s extension of the federal Investment Tax Credit, the pipeline is at an all-time high, and the market is beginning to truly diversify geographically. 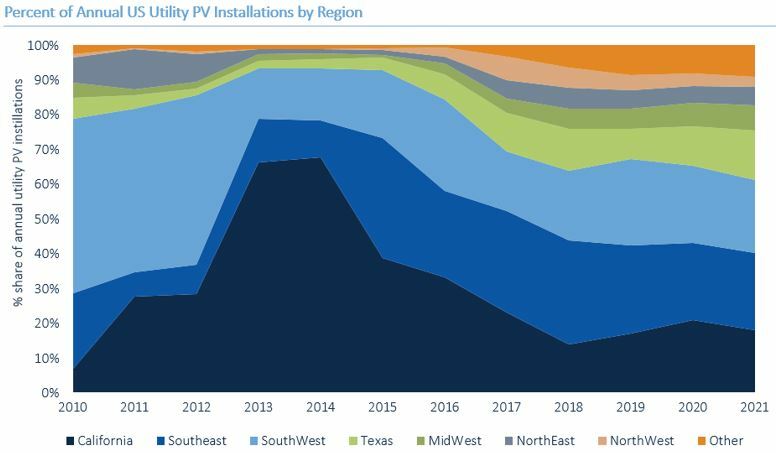 Over the next five years, GTM Research expects that utility PV will continue to grow into new state markets and regions. And it won’t solely be driven by renewable portfolio standards. With power-purchase agreement prices now ranging between $35 per megawatt-hour and $60 per megawatt-hour, voluntary utility procurement, PURPA-driven procurement, and wholesale C&I procurement are expected to collectively drive as much pipeline replenishment as RPS obligations. Over the next five years, several markets will emerge as new leaders of utility PV. GTM Research points to a number of states on the rise, including Texas and South Carolina. By 2017, Texas alone will consistently represent over 10 percent of annual utility PV installations in the United States. Currently there are 891 megawatts (DC) of PURPA projects in development, and that number is growing quickly. GTM Research forecasts the Southeast as a whole to drive the most voluntarily procured utility-scale solar between 2017 and 2021. “As RPS-driven demand dips in 2017 and 2018, we will see PUPRA, corporate procurement, and voluntary procurement surge forward as average PPA prices continue to decline, ” said Smith.